What’s eating the Kapoors? Sukanya Verma gives you some answers. If it’s not complicated, it’s probably not real. For families fight, they get on each other’s nerves and, sometimes, they let each other down too. It’s why we cherish photographs; they’re an ideal version of us, where in that one fleeting moment we forget all our differences and unite to say cheese. Truth be told, Punjabi families are a genre in themselves -- I’ve got Band Baaja Baarat, Khosla Ka Ghosla, Vicky Donor, Monsoon Wedding, Do Dooni Chaar, Queen, Dil Dhadakne Do to back my observation. Having married into one only corroborates it. But Batra is nothing if not subtle. 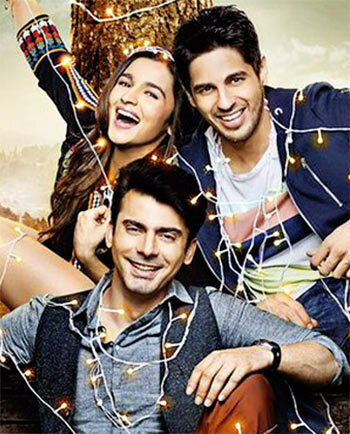 In Kapoor & Sons, he draws the essence, idiosyncrasies, wit and high-strung spirit of a familiar Punjabi household but never lets it become the highpoint. It’s a remarkably active screenplay; there must have been pages and pages, filled with a constant flurry of breathing, breathless folk -- angry at one another, angry with themselves. That jittery feeling of playing a mute spectator to a loud, ugly quarrel is how authentic the fight sequences in Kapoor & Sons get. 'My family fights all the time but this is the first time they fought in public,' is Arjun’s (Sidharth Malhotra) embarrassed admission to Tia (Alia Bhatt). He’s talking about what would have been named The One Where Grandpa Kapoor Is Gifted A Mandakini Cut-Out On His 90th Birthday if not for a public spat between his endlessly warring parents. Let me give you a picture. There’s Arjun, the quintessential black sheep, a wannabe writer who’s down from New Jersey after learning about his grandfather’s heart attack. His older brother, Rahul (Fawad Khan), based in London, is a calm, cultured best-selling author. One harbours resentment over a dark betrayal; the other holds a personal secret. I am not telling who’s who. Except that I knew about this 'secret' all along and it’s not the reveal but his handling of it that deserves kudos. Their father Mr Kapoor (Rajat Kapoor’s dignified in his though vanquished could still argue) grumbles about the weak finances but never has the last word around his indignant wife (Ratna Pathak Shah) whom he’s obviously wronged. The senior-most Kapoor (Rishi Kapoor) in the household, at 90, is a lively old man and the only one with a sense of humour -- quite a raunchy one at that -- in a room full of hostile people. He’s lived long enough to devalue the present and not waste his energy in tying himself into knots over disappointments, jealousy, guilt or regrets. There are characters we never see or only sparingly -- Timmy, Anu, Boobly and all the miscellaneous Kapoors that render the story a reality outside the visible. Alia Bhatt’s presence acts as sunshine in Kapoor & Sons even if she’s not central to story nor a catalyst. The baggage its principal characters lug around is balanced off by her froth, her silly 'size' jokes and romantic impulses. No problem for the naturally spunky actress. The cast is a great asset here. Rishi Kapoor, Ratna Pathak Shah and Fawad Khan top the podium of scene-stealers. Kapoor, looking a bit like Jim Broadbent under layers of skilful prosthetics, has a field day mocking the most talked-about aspect of his father’s 1985 offering. Pathak Shah displays both ire and vulnerability in ways that makes her hurt and folly more human than anyone around her. Fawad Khan demonstrates what wonderful tools are grace and sentiment when baring oneself to the camera. It’s time one acknowledged the talent beyond that ridiculously good-looking face. Sidharth Malhotra doesn’t look the part of an aspiring novelist. And when the movie isn’t trying to convince us he’s the next J D Salinger, he indeed conveys the offhand tone of his mildly rebellious character and works up easy chemistry around Alia. But his response in his most significant scene with his mother -- when he learns what he does -- is terribly self-conscious and almost negligible in impact.